Rebecca is the leading Diet, Eating Disorders, Disordered Eating, and Food Addiction expert and the founder of Rebecca’s House, a transitional living residence for women recovering from eating disorders. She has taught her Diet Recovery methods to mental health professionals internationally. She is the author of Diets Don’t Work, a recovery handbook. You can learn about Rebecca Cooper’s Online programs at www.DietQ.com. Rebecca Cooper created the first transitional living residence for eating disorders. Her eating disorder program is used throughout the country at treatment centers and by therapists. She is a licensed therapist and Certified Eating Disorder Specialist and iaedp approved Supervisor. During this year’s State of Recovery Conference, don’t miss a very informative workshop from eating disorders advocate and trailblazer, Rebecca Cooper. MHA provides all of its services in a supportive environment within the context of a psychosocial rehabilitation philosophy, with wellness and recovery the goal. This client-centered approach emphasizes wellness rather than illness, resulting in effective life management, empowerment, independence, self-sufficiency, and community re-integration – regaining dignity and dreams. Rebecca will present a workshop sponsored by the Mental Health Association of Orange County (MHA) at their 21st annual Meeting of the Minds. MHA seeks to promote the positive mental health and emotional well-being of Orange County residents, working towards reducing the stigma of mental illness, developmental disabilities, and providing support to victims of sexual assault and other crimes. In partnership with service recipients, families, volunteers and the community, MHA strives to fulfill its mission through culturally competent advocacy, direct services, public education, and responsiveness in times of community emergency. The 2015 International Mental Health Congress will be held in Lille, France. This year’s topic will be “Mental Health for All: Connecting People and Sharing Experience” Rebecca will be talking about Eating Disorders as complex mental health conditions that involve genetics, environmental factors, psychological disturbances, neurochemical and biochemical changes, and disturbed thinking patterns. She states, “Treating eating disorders requires an accurate diagnosis with the right assessment tools, medical and psychiatric stabilization, nutritional accountability, cognitive restructuring, the instillation of hope, self-love and a connection to Self and the appetite. Neurochemical and genetic expression can be altered and are implicated in disordered eating, food addictions and eating disorders.” This new information will change how eating disorders are understood, prevented and treated. Families and Communities Together (FaCT) currently works with 12 Family Resource Centers (FRC) throughout Orange County that provide services to the community, such as counseling, domestic violence services, family advocacy/case management and information and referrals. The goal of the partnership between the County of Orange and the FRC’s is to reduce the risk of child abuse and creating a safe and stable home environment. They provide training opportunities regarding their client/community needs. This venue will include therapists, case managers, staff and communities. Rebecca will speak about eating disorders and cutting, particularly in teens. Dean Margaret J. Weber developed the Dean’s Distinguished Lecture Series in 2010 with the generous support of Susan and Don Rice. To honor her legacy of exceptional leadership Pepperdine University has endowed the lectures as the Margaret J. Weber Distinguished Lecture Series. The lecture series was founded by Dean Weber to inspire dialogue about the challenges and leadership opportunities in diverse communities across the world. This forum educates students, faculty, staff, and community members beyond Pepperdine. The World Council for Psychotherapy is a Non Governmental Organization of the United Nations Organization affiliated to the Economic and Social Council (ECOSOC) since May 2003. UN Delegates of the WCP represent the World Council for Psychotherapy at international meetings of the United Nations to promote psychotherapy and help finding solutions to diverse problems. Research findings as well as different psychotherapy approaches, and psychotherapy for different patient groups will be presented. Besides the lectures and seminars to be presented at the world congress, Durban will be a meeting place for psychotherapists from all continents where new projects will come into existence and will be shaped for the future. Behavioral Healthcare magazine and Medivance are hosting a panel event in Scottsdale, Arizona. You can register here. Rebecca Cooper will be addressing 2014 Business Trends in Behavioral Health Care and will be signing her book, Diets Don’t Work; Healing the Cycle of Yo-Yo Dieting and Emotional Overeating. Five years ago, I was part of a group of eating disorder professionals and providers who started brainstorming how we could provide clinician’s and treatment providers with a more cost affordable conference. The goal of the conference was to simply pay for the cost of the conference and to be able to have seed money for the next year. This conference has been a success from the first year. This year’s conference is in Tampa, Florida on June 13 and 14, 2014. Join us at this year by registering at http://theseedconference.com. 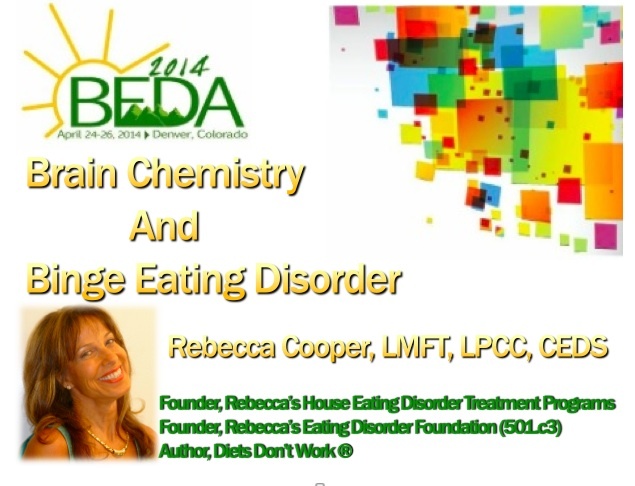 Rebecca Coper will be presenting in Denver, CO on Friday, April 25, 2014 at the 2014 Binge Eating Disorder Association conference. Scientists are showing that some foods may produce alterations in the brain that can cause bingeing behaviors for some people. In this presentation participants will be provided with the current scientific research about eating disorders and assessment tools for food related mood disorders, eating disorders and food addictions. 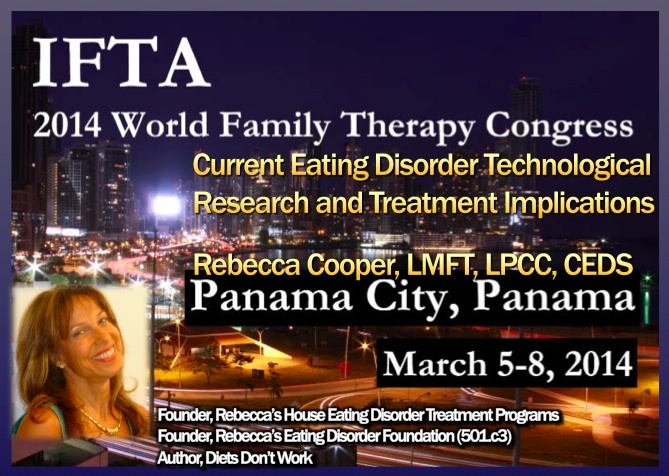 Rebecca Cooper will be presenting in Panama City, Panama about Current Eating Disorder Technological Research and Treatment Implications to an international audience of mental health professionals. Rebecca describes underlying reasons for eating disorders on KCRA Sacramento live TV interview on November 12. Rebecca is scheduled to present on the topic of Eating Disorders and Brain Neurochemistry at the upcoming NAADAC conference in Atlanta. Rebecca Cooper is interviewed about the prevalence of disordered eating in the United States. The etiology of eating disorders is reviewed and steps to take if you or someone you love may be exhibiting symptoms of eating disorders. Rebecca will be taking live calls on ‘Call The Doctor’ Show. Call 1-800-326-9842 or submit questions online at http://www.wvia.org/live-show-comments. Rebecca appears on a live segment talking about the signs and symptoms of eating disorder, why diets don’t work, and how to live free from disordered eating.